I hate the spending journal, hate it! Gail says you can't move forward in the process until you nail this - it takes discipline... I still hate it. I hate remembering to ask for receipts, and then trying not to lose them. I hate that my notebook gets lost. Enough of that...I need a bit of advice. For those of you that use a spending journal, how do you build it into your daily habit? Right now, ours is sitting on the kitchen island, with a pen next to it. I try to remember, but when I walk in the door the first thing I'm doing is taking care of the dogs, loading/unloading the dishwasher, and setting up our lunches for the following day along with getting dinner started. The other part I'm struggling with is getting Jordan on board with using it too. He's really good at asking for receipts, but then he just hands them to me to deal with. Okay - so I haven't actually asked him to do it himself, and normally the money management piece is all mine. So I should do that. Hah! Maybe he'll just read it here. The other real question I have, is how to do you manage the journal when you're making a purchase from planned spending savings accounts. We bought some camping gear b/c we had saved some money for it, but it's not part of or normal day-to-day spending cash flow. Do I make and additional and then a subtraction? Same applies for using our vehicle/emergency fund. We had a few hiccups this past week and I'm not sure how to add and delete the same funds effectively. It seems silly. We're not giving up, don't worry! Just need to start again. My march spending update is going to be mostly from a reconciliation of our day-to-day chequing account and credit cards - but that will be supplemented by the receipts we did keep. Just a quick note to tell you that I updated the 2014 Budget Page. As soon as January rolls around, I started to get excited for tax season. I picked up a copy of TurboTax from Costco for $28 on an awesome sale and we got our taxes finished and submitted during the first week of March. This year we had deductions for the interest costs for an investment in company shares, educational credits for me going back to school not to mention the regular deductions for RRSP/Pension contributions and professional memberships. We're received a refund of $494.64 for me and $1,400.97 for Jordan for a grand total of $1,895.61 last week. $1,200 went straight to debt snowflakes, $500 was split between Vacation, Christmas, and Home Maintenance Planned Spending and then Jordan and I split $200 for some mad money. What I have been doing for the last several years is tracking our spending by reconciling our debit and credit card transactions...and while that tells us if we hit the mark, it doesn't keep us on track during the month. What ends up happening is that I categorize an entire shopping trip to Costco as groceries but we might have purchased dog food, and a couple of t-shirts while we were there too. I think this activity is also really going to help me get my head around Anonymous' comment from a few days back about how much Jordan and I spend (combined) on groceries, eating out, and alcohol. The eating out and alcohol are accurate - but perhaps sometimes they should be categorized as gifts if the bottle of wine is for a house warming. First things first, we need a book. As I am writing this post, it's March 13, 2014 - though i'm scheduling this for later on in the month. 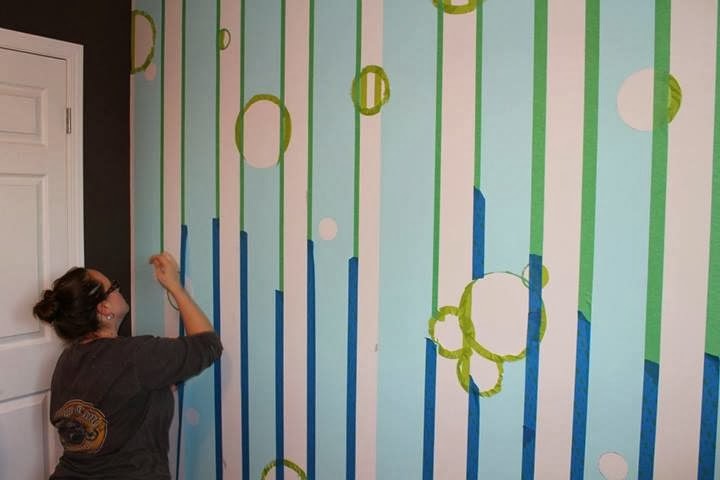 So this picture is when I've started...but I hope in the next few weeks - I've got something more substantial to show you. It's that time of the year for me! Every year my company conducts performance and salary reviews in the first quarter. I had my meeting a few weeks ago, and it went spectacularly well! I've been awarded a 5.633% raise! It's a $4,000 increase taking me from $71,000 up to $75,000 gross! The additional $333.33/month winds up being about $92.75/pay after taxes. That's sure not going to hurt the snowflakes! For anyone with a keen eye, you might have noticed that my cash-flow posts have incorporated this new rate. It should become effective the first pay period in April. I left yesterday's post hanging - I didn't feel as thought I had adequately met Gail's challenge to balance our cash flow, so put it all in a spreadsheet (easier to manipulate then a calendar), and started moving payment days around to find a schedule that didn't have us in the negative once. Once I got it into the spreadsheet, it was actually a lot easier to manage, and I found a single bill that would make a big difference. We've moved the billing/withdrawal date of our Shaw bill from the 8th of every month, to the 22nd - just two weeks later. This assures us that Jordan will always have received his first pay cheque of the month (the 15th), before the bill is withdrawn. This image shows you what the the cashflow looks like now. The image doesn't include the updated Shaw bill - but the flow will just be slightly higher when I do, not less. Shaw was great about moving the date, and I feel much more confident about the ins/outs. Though we do still have to manage the large number of transactions that are scheduled to occur on each of my pay-days. There is risk that if my payroll is not processed prior to the mortgage payment, and other automatic withdrawals, that we could dip into the negative - or have a payment bounce. So, for that reason - I still think it's a good idea for Jordan and I to have an account buffer...but what's the right amount? To help figure that out, I decided to simplify the chart above to get a clearer picture of the risk, and assume that the withdrawals happened on the same day, but prior to me getting paid. I also wanted to project forward a couple of months b/c Jordan's paid a bit more this march (due to his guaranteed salary for the first 90 days of his new job before he switches to half commission/half salary). I also moved Jordan's second pay to the beginning of the following month - because then it's ordered correctly to pay the bills that are due before my first pay day. This actually took wayyy longer than I thought it would...mostly because I kept making math mistakes. The first time around, for example, I forgot $200 in regular escape payments because those are still weekly, not bi-weekly. I wish that I had done this before - It's been a really helpful exercise to get a handle on the cash flow. At the beginning of March you can see I added a 'Need' row. It was clear that the buffer we already had wasn't doing it's job! So I'll be transferring $515 from my emergency fund, and moving it here once I hit publish on this post. The part I had the most difficulty with was figuring out when, and how much I could take the 'left over' from the account and sweep it into the Escape Snowflakes. I would really, really appreciate your thoughts on this one. At first I thought at the end of the month, then I thought at the beginning - but after working it through, I think that once I've received my first pay of the month. I should be able to sweep the balance of the account, less my pay. Any questions? Do you think I missed anything? Make a list of what you have to pay by date. Okay! So I thought the best way to do this for Jordan and I is to use Google-Calendar, because we track all of our other activities that way anyways. To the left you can see all of our bills, and the dates as well as our paydays (green box). That takes care of step 1-3. The next is to sort out which bills can be paid for by which pay cheque. We'll start with the first series of transactions, just prior to being paid on April 11th. All of these need to be paid for by the pay days that preceded it, less the amounts that occur on the same day as payday on March 28th (planned spending, and mortgage). So - combined, Jordan and I will be paid $2,785.92 at the end of March. I'll deduct $770.22 and $1,150 for planned spending - which leaves me with $865.70. Prior to the next pay day (April 11th), we have $963.87 in payments which leaves us overdrawn by $98.17. The problem here, is that not only would we be overdrawn by about $100, we also have several transactions about to happen and if the timing isn't perfect on our automatic payments and withdrawals, we could be in deep ca-ca. Let's keep going to see if it get's any worse. From here, I can add one more pay day (mine), and deduct the transactions on April 11th, and the 14th. That brings our balance down to $362.12. But...we have a pay day, so we'll top up the account and settle at $667.53. Following Jordan's payday on the 15th - we have payments on the 20th, 21st, and 22nd and our account is brought down to $191.08. Following that, it's payday again, along with our planned spending and mortgage payments. Again - depending on the order that the automatic transactions take place, we could be in trouble - but when the dust settles, we're up again to $956.78, ready to tackle the payments at the beginning of May. There's a lot of ups and downs here! 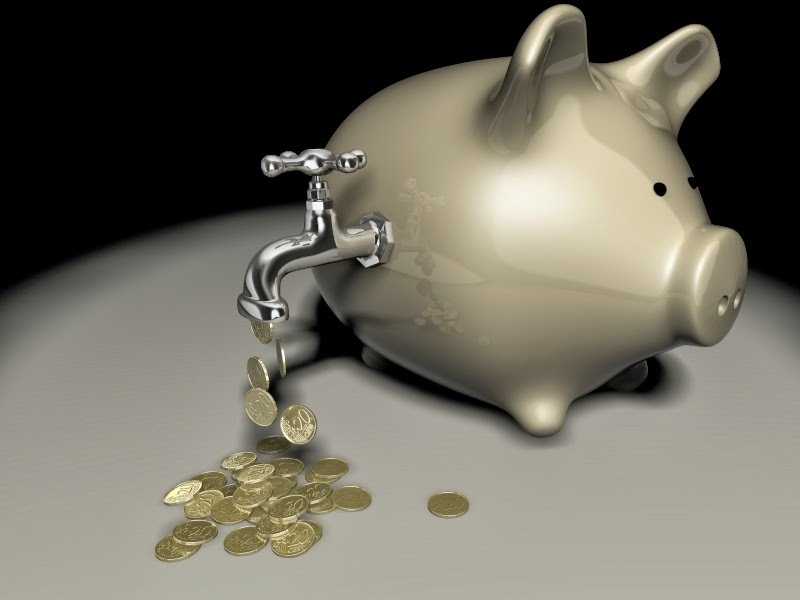 Traditionally, what we have done to avoid overdraft (haven't paid an OD fee once in my life), is keep our own buffer, or cash overdraft if you will, of $2,800 in our chequing account which helps us manage all of the flexibility of the ins/outs of our cash flow. I get the feeling though, is that if we followed Gail's method, and perhaps moved some payments around - that our 'buffer' wouldn't have to be so large. I'm not ready to call this task complete - I think I'm going to look at the numbers some more and see if I can't get some of the payments that happen in/around the 8th of the month, moved to the second half, after the 15th. In my recent efforts to clean up my blog and get writing again, I noticed I hadn't actually posted this back when I wrote in October, 2013. 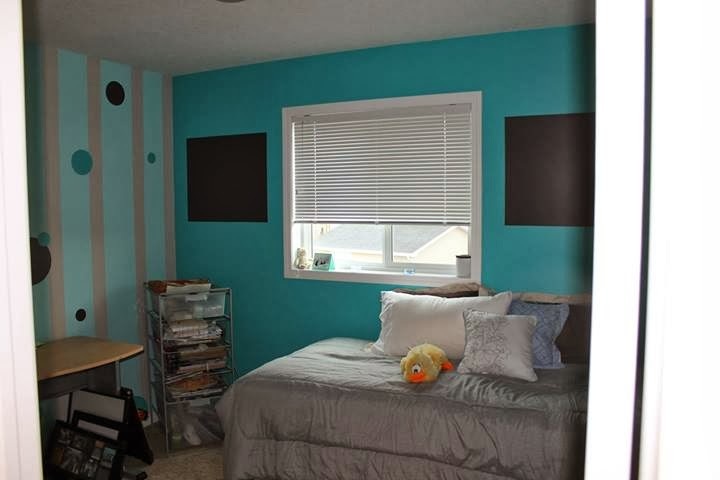 When Jordan and I moved into our home, it was (and is still mostly) builder beige/white. 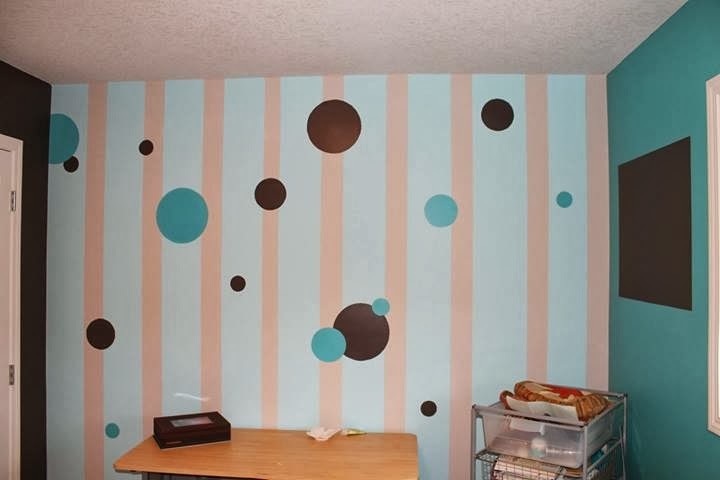 I wanted my craft room to feel a bit funner, inspiring and so scoured the web for inspiration and finally found this concept - stripes and circles! Well, I'm super proud of how it turned out, so I've decided to share. The big blocks of brown will eventually host family photos and the third wall that you can't see has the light taupe colour. The fourth, and final, activity in level 1 is to create a networth statement. This was a pretty quick activity for me - but I did make a change to my regular networth statement (and why I missed posting for March 1st). I've been including our home's market value, but I have not been including the costs that we would incur by selling our home to realise this gain. That is now reflected in the statement. The trade in values for the vehicles are updated once a year or so by the dealerships, so this is a fairly accurate number. Wahoo! I've earned my first badge! You might have noticed that we already have $800 in our debt snowflakes tracker. I had worked a tonne of overtime a while back and when I hit my banked-time maximum (75 hours) the remainder was paid out. This represents that payout! Activity 3 is to make a Balanced budget....balanced. I already have a budget set up (see the 2014 budget tab), but I wanted to go through this process to have the opportunity to really look at everything. So, I decided to download Gail's Build-a-Budget Excel download. I made a few additions and a few deletions to account for categories we do, and don't have - and for variable expenses, I used the average numbers from 2013. The big caveat here is that i didn't adjust Jordan's income to 2013 numbers - I've used his new base salary which is much lower (he's now half on commission). So! If we made no changes, we'd be in deep ca-ca over spending by almost $1,700/month! But we're not going to do that, no siree! Yes, yes, I know that the total is still a negative, but that payment won't be made unless Jordan's commission is at least that amount. This goes back to my promise a few days ago. When we get Jordan's Commission pay - the first thing we're going to do is add extra to the escape - that's what the new Escape Snowflakes tracker bar is all about. Plus, this doesn't include the recent change to our phone/tv/internet which will be going down. After writing today's post yesterday, and then reading it again today, I felt good about saving the $20, but it didn't feel like enough. We went back through the TV plan and decided to get rid of the premier package ($89.99) and move to Personal (basic) TV plus the Best of HD for a total of $74.90. That will bring in an additional $15.09 in savings! That brings our total bill from $180.40, to $149.90! It seems that less and less people actually do...I actually feel like a bit of a dinosaur for still having one. Every time it comes up, we always find a reason to keep it...but here's the thing, we really...really don't need it anymore. Our personal cell phones have unlimited national calling....so why pay for a service we don't need? Especially, when yesterday I wrote about needing to come up with an additional $230/month to get the Escape and Line of Credit paid off within the next three years. So, Jordan and I not only looking at our house phone, but our whole package with Shaw. That brings us down to $160.40 - saving $20/month. It's not a lot, but it's a start. We could save another $15, we we switched from a rental agreement to a two year purchase agreement where we would have no fee but be committed to Shaw for 24 months. If we left, we would have to pay an early penalty of $15/month times the remaining months. Do you think it's worth it? We talk about switching companies from time-to-time, but in reality - we probably won't unless it was a super good deal to move. You might have also noticed that I dropped our internet down, we lose a loot for only $5 savings - but here's the kicker. We're not even coming close to what we're aloud to use...plus, there is NO penalty for going over the bandwidth limits at this lower tier...none! This is our usage graph from Shaw...the green line is what we're permitted to use....you can see that we increased it when our friends moved in temporary in anticipation of much higher usage - but that never happened. If anything, we used less. The change goes into effect this Friday, so i'll be updating the budget - but I'm still going to keep our commitment from yesterday, and keep tracking those Escape snowflakes! This activity really aligns with what Jordan and I were talking about over the last few weeks - increase mortgage payment, pay of LOC, or pay off escape. Well...let's look at it all and make a plan. Gail feels very strongly that all debts must be paid within three years of starting a pay off plan in order to avoid debt fatigue. It has to be quick enough to realize gains without being so fast that it feels like an impossible task. So...leaving our mortgage out of the equation we have two car loans and a LOC - given that the Kia has a 0% financing I'm going to focus on the Escape and the LOC. Jordan and I currently have $900/month committed to debt repayment - so we're short $230.96/month to get it paid within three years. I believe very strongly that we will be able to come up with these funds with Jordan's Commission - but we need a way to stay on top of that. To help us do this, I've done two things. Added an extra line item on our monthly budget 'Extra to Escape' (because it has the highest interest rate) - as a reminder that money needs to go there before into the planned spending categories. Added a tracking bar on my blog to stay accountable for the extra $8,314.56 we need to come up with over the next 36 months. So, there's the plan...what do you think? I've been tracking our spending for a long time, so this task was pretty easy for me to do. Here was our year-over-year comparison for the last four years, and I've added 2014's average so far. Groceries has been on the rise and as already described eating out and alcohol took a dip in 2011 but then have been rising ever since. Entertainment is on the rise as is vehicle maintenance - though with having two vehicles again, I'm not surprised with the dip and the return to 2010 levels. We're down a bit now, and so that's a good start to the year. Home Maintenance is way down now that we're not in 'brand new house' mode, we want to buy everything to make it pretty' mode. In to 2014 and Gas has indeed gone down - now that we're out of the worst of winter, I hope it will go down a tad more because we won't be warming vehicles up in the morning any longer. We're on a great start with groceries (thought an Anonymous commenter from yesterday has me thinking that Jordan and I have an opportunity to talk and really make some goals around this). Eating out is creeping up, as is Alcohol. We're on track for Entertainment, Pets, Medical...and I'm actually fairly happy with all of the remaining categories so far. What is evident - and I know, I know I've said this before - is that our weekly budget of $300 just isn't cutting it...need to have a think about our spending strategy...and perhaps our non-spending strategy. I cant tell you that we haven't changed anything yet...but I'm hoping that through Gail's process, we might just get closer to working this one out. Check out the My Money, My Choices programme by clicking here. I've just finished February's spend report - but thought I would post it along side January for comparison. You may remember I mentioned it had been a busy month - the gas bill sure shows it! We're way down on groceries - but I would expect my mom's was higher than it normally is...I also traveled a lot for work and meals were comped. We don't usually spend a lot on pets outside of dog food - but this was an extra bag to leave at my mom's house along with a new leash for Aries. Vehicle Maintaince - we had a 12 point inspection done for hitting 12,000 KM's on the Kia - everything is in good shape there and also had a few car washes and other odds and ends. The Clothes bill this month is actually for drycleaning. Jordan is wearing suits and dress shirts again so I expect to see this as a semi-regular occurrence going forward. I registered for my fourth courses for the program I'm taking in school. I've already been reimbursed through work for this one. One of my Great Aunts lives in an Assisted Living Facility here in the city. 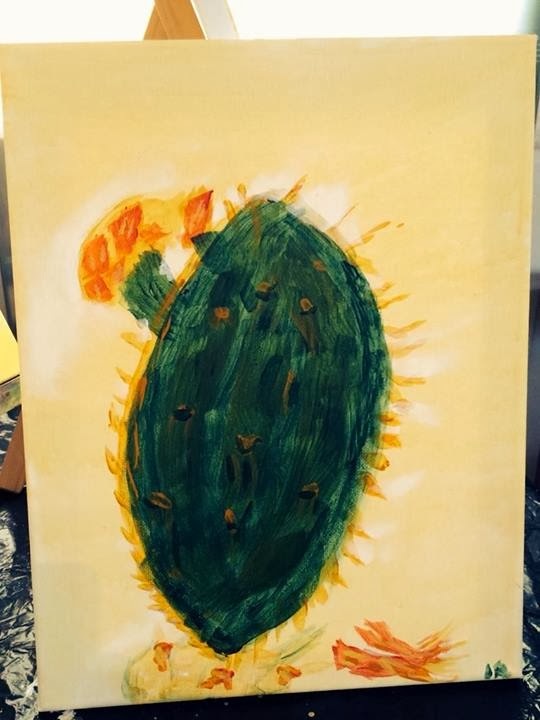 When I was visiting last week, I snapped a picture of her latest masterpiece. I've just signed up for Gail Vaz Oxlade's newest project: My Money, My Choices. I'm wondering if anyone else has decided to go through her process? 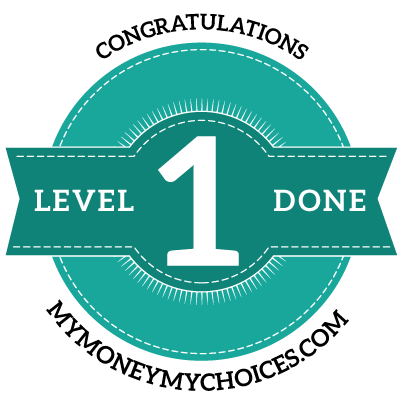 I've just registered and am at Level 1 - Financial Literacy. I think I'll probably get through the first couple of phases pretty quickly (I've kept a spend record for three years, so that'a tick box for the first activity). I haven't found a community or team to work with yet - but I wanted to log in and get started to see what it was all about first. I would love to hear your thoughts on if you've started the program, heard of it but aren't interested - or anything else! As I work through the process, and the activities, i'll post my progress on my blog. It's so so sooo tempting to increase our mortgage payments - but with the loan sitting at 3.39% and our Escape at 6.90% - it's hard to justify that over the Escape. But now that we've changed our payment scheduled to accelerated bi-weekly, I don't like seeing that the amortization has gone up. Here's some scenarios for what we could do. Our current payment is now $770.22/bi-weekly and we could increase it as high as $885.75. We could drop from 24 years amortization to 15 years, 6 months....from being 53 to 44 years old w/out a mortgage.... wowza! ...but what would we have to sacrifice now in order to do that?..For each of these scenarios we would need to come up with $29.78, $54.78, $79.78, or $115.53 bi-weekly. I should mention...just in case there's anyone new reading along - that this monthly budget is based on Jordan's salary with no commission. I can't budget fixed amounts for that - but it's how we intended on reach the rest of our planned saving/spending goals. We also intended to continue to pay of the LOC, and Escape using commissions. One last thing.. in case your interested....the interest rates. Wowza! It's been a long time since I've written. February is a pretty hectic month for me generally speaking. I spend a lot of time back home with family ( I went three times) and my brother comes in from Eastern Canada for a visit with his girlfriend. I also went to Ontario three times, northern Alberta twice and worked a crap tonne of Overtime for work. Jordan and I also had houses guests on the weekend when I wasn't in BC. So...its been busy. Here's the thing though - I love busy! So...that said, on to today's topic. Since Jordan has started his new job and his salary went from every two weeks (bi-weekly - opposite weeks of me) to bi-monthly (15th and the last of the month), I've been trying to keep up with weekly payments on all of our planned savings, retirement and debts...it was getting a bit much, so we decided to switch everything to bi-weekly and sync things up with my pay schedule because Jordan's salary will fluctuate a lot. Most were pretty easy to do - all of my ING funds were just a quick switch. The streetwise funds too slightly more effort to organize, and the Mortgage took some time as well. Because technically we're now 'short' two payments of $385.11 and we'll pay a bit more interest because of the change - the remaining amortization changed. The last thing I have to sort out is the payment on our Escape - we fought tooth and nail to get it switched to weekly and things got so messed up when we did that last time BMO took wayyyy more money then they were supposed to and bounced a mortgage payment...so, I'm nervous. Jordan and I are debating just paying off the Escape with the LOC (and I know, I know, we've talked about doing that before) - I just can't decide.